Over the Summer Holidays my little sisters came round for the day so they decided we were going to bake some cookies turning up with this recipe (I can't remember where it's originally from) and they turned out so amazing, we slightly altered the original recipe as it included far too much chocolate and the cookies were literally just chocolate blocks haha. 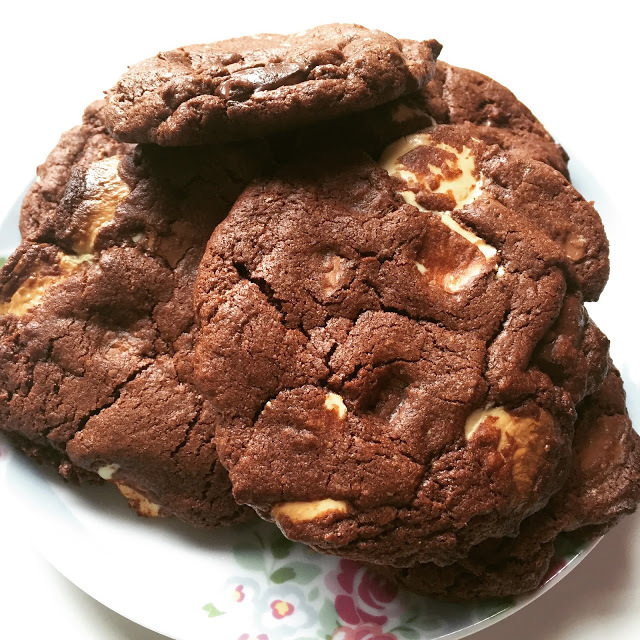 So here it is my slightly tweaked version of some recipe my sisters brought round so you can enjoy some ridiculously gooey overly chocolatey cookies! Preheat the oven to 200 degree C, and cream together the butter and sugar until smooth. Add you egg and dry ingredients before mixing together. Break the chocolate up into small chunks and add them into your mix, the mix will mostly be really stiff and pretty much all chocolate chunks. Add your milk a little at a time until desired consistency, I did it until the mix was a little soft and gooey. Now make little balls with the mix and put them on a baking tray flattening them a little as you do. Demolish them with a cuppa. So there it is, the simplest recipe you can get for cookies! Let me know how yours turn out if you try it! You make it sound so simple but I know I would end up setting my kitchen on fire. Can you make me some instead pls?